We Took a 3 Year Old to Six Flags! For Hubby's work we got the opportunity to go to Six Flags for a discounted rate on June 26th. And we decided to take our 3 year old. You may remember me taking her last year. For $25 per person we got entry into the park, free parking, and a buffet from 4-7 pm. The park was also closed to everyone except us from 9pm to midnight. We could have taken her last year, but Hubby didn't think she would be able to ride anything. So when I got to take her for the Wet Ones blogger event, he knew we could this year. 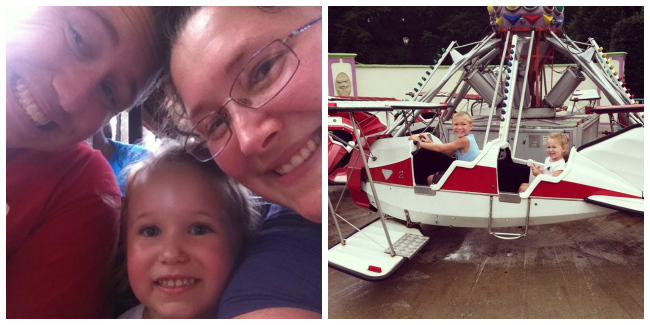 I told Hubby that even if we can't ride some of the rides with her in the kiddie area, it is worth it to see her face. We started our trip on the train and then stood in the rain waiting to ride Monster Mansion. SweetPea didn't like it as much as she did last year. Then we headed over to the kiddie area where I was bummed the Willie E. Coyote "roller coaster" wasn't working because SweetPea would have been tall enough this year. But she made a friend and had fun regardless. I am a Nuby Mommy Blogger and received complimentary items to review. All opinions are my own. We left Peanut with my in-laws. We didn't leave for Six Flags until after SweetPea had a nap, since we wanted to stay until after 9pm. So we had to make a stop out at the car only once for me to pump (I also pumped on the way there). I brought everything with me including a cooler, wipes to clean my breast pump parts, and Nuby Natural Touch Store N' Feed Breastmilk Containers *. The thing I like about these containers is that if you have the Natural Touch Softflex Silicone Nurser * your baby can also drink from them as well. I pump in the mornings, but I have never had to be away from my Peanut for more than one feeding. So it was a bit of an experience. When SweetPea was a baby, I did stay a night away from her to go to Dragon*Con, but I forgot bottles for my pump, so I had to hand express. I was pumping and dumping anyways, but it was a nightmare. Not wanting the same fiasco to happen again, I doubled checked every thing this time. I still managed to forget batteries and my pump was dying. :/ I don't have the Nuby Electric Flex Breast Pump * that you can use to directly pump into the Store N' Feed containers, but I needed to have the containers there because I knew I would need my pump's bottles to pump into. The containers only hold about 3 oz, so if my pump was at full power or if I had more time to pump, I would have to use more. They were great to have though because I felt confident they wouldn't spill out when I put them into the cooler, which was my main fear. I ended up only pumping 7 oz and Peanut ended up eating 13. :/ They are also made from BPA FREE clear, break-resistant plastic so easy clean up when we got home! My daughter didn't care for us going out to the car for this pumping session, but we rode Thunder River before heading out, so it gave us a chance to change our clothes. When we went back in, we went to the kiddie area first because we didn't get to ride everything the first trip in. But although they told us we this part would stay open late, they closed it at regular time. So we were a little disappointed about that. We rode the carousel and the old timey cars plus all the other little rides that way. Hubby rode the Scream Machine while I gave SweetPea some snacks. She ate TWO WHOLE hot dogs earlier that day, but still devoured ALL the snacks I had brought with us. We ended the night with another ride on Thunder River. I have never rode it at night so it was quite the experience. Both times our little family ended up under the waterfall but SweetPea LOVED IT! She was such a brave girl and I can't wait until next year. I received complimentary products from Nuby to provide this review. All opinions are my own. Looks like she had a great time. I hope the baby did Ok without you as they love their mom. It was good you were able to pump for the baby. I think a lot of places these days have lots to do even for the little ones. I think the hardest part is that you pay so much money but might have to leave early because they get tired quicker or need to go to bed earlier. Looks like everyone had a blast! Even though I got a bit scared just by reading the title, LOL.